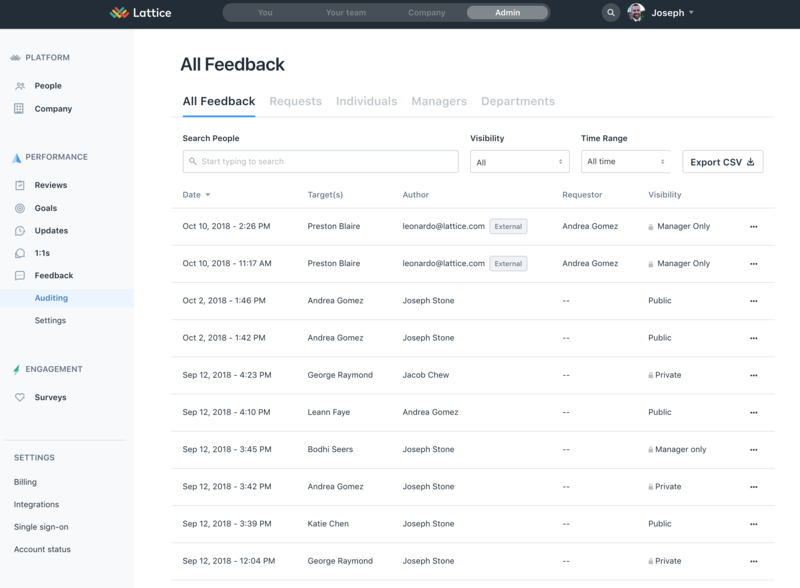 As an admin, you can manage your organization's Feedback settings and get an overview of how Feedback is being used from the administration panel. To access the administration panel, click "Admin" from the top navigation and then the "Feedback" link on the left side of your screen. From the Feedback administration panel, you are able to audit all Feedback from all users, view Feedback summaries for all users and change Feedback settings for your organization. To view individual Feedback records, click the "Audit" tab and then navigate to the "All Feedback" tab. From this table, you can view the details of a specific Feedback entry by clicking the dotted dropdown marker (...), followed by the "View" link. You can also delete a given piece of feedback by selecting "Delete" from this menu. To search for a specific piece of feedback, simply type what you're looking for into the search bar at the top of the "All Feedback" table. 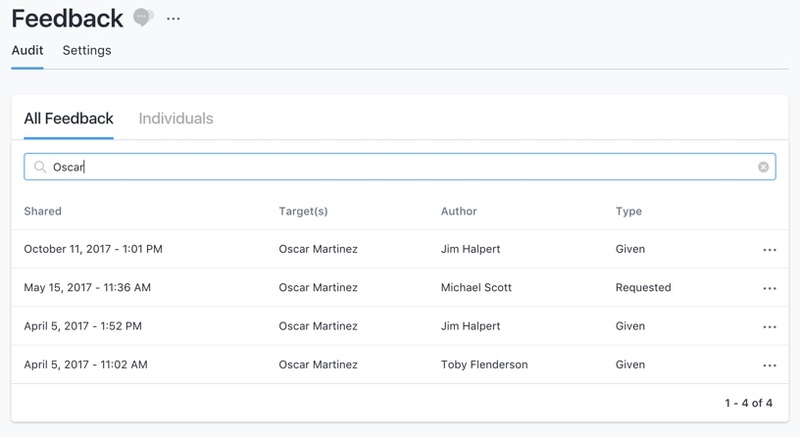 Within the "Audit" tab of the Feedback administration panel, navigate to the "Individuals" tab to view a brief summary of a person's Feedback usage. By navigating to the "Settings" tab at the top of the Feedback administration panel, you can enable or disable private feedback and manage the values for your company that can be applied to any given Feedback. 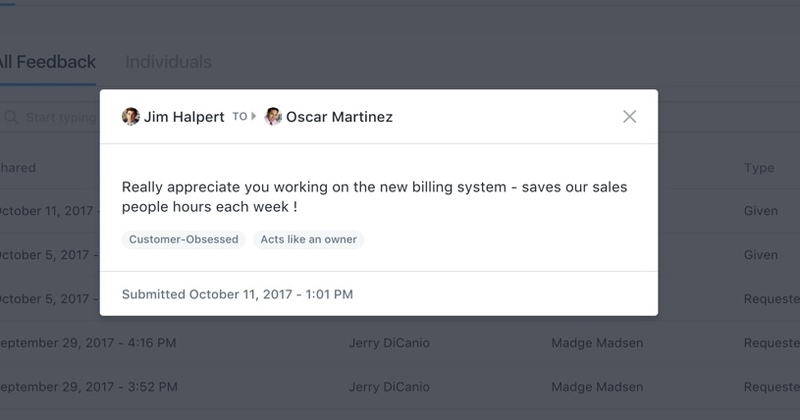 You can allow managers to view private feedback that is given to their direct reports by enabling Private Feedback for your organization. This setting can be changed at any time and affects all managers within your organization. Giving feedback can often be an effective way to reinforce the values that your company holds most important. These values, created and managed by company administrators, can be attached to any piece of Feedback and help remind contributors of your values and praise those who embody them.